This encouraging book gives parents an easily implemented plan for training their children in the principles of God's Kingdom. Danny Silk replaces traditional punitive approaches to discipline with practical strategies for strengthening the hearts of children to fulfil their destiny! About "Loving Our Kids on Purpose: Making a Heart to Heart Connection"
&Here is a fresh look at the age-old role of parenting. 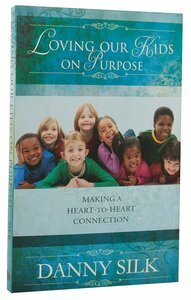 2 Corinthians 3:17 tells us that &"Where the Spirit of the Lord is there is freedom.&"
Customer Reviews For "Loving Our Kids on Purpose: Making a Heart to Heart Connection"
Danny Silk challenges not only how you parent, but also how you need to take responsibility for your own relationship with God. This book will help you grow in maturity as a Christian, and help you help your children mature in their relationships. An excellent book from a great author. Highly recommended!